Cook the potatoes in salted boiling water until tender, drain and mash, trying to make sure the potatoes are as lump free as possible. Place the mash into a bowl, season with salt and milled pepper add the flour and using a fork bring the mixture together to form a dough. Knead for a couple of minutes. Split the dough into 2 and then roll each into a sausage shape. Cut the dough into 2cm pieces and using the back of a fork press gently each gnocchi to give an authentic look. Meanwhile for the sauce, simply fry the onion and garlic in the olive oil over a low heat until soft, add the tinned tomatoes and season with a little salt and milled pepper. Stir in the basil. Cook the gnocchi in the boiling water until they rise to the surface, drain. 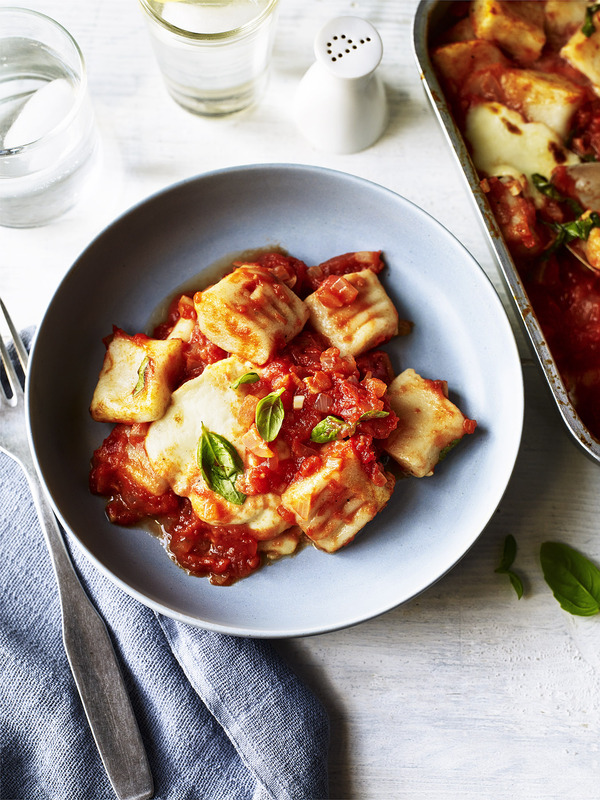 Mix the gnocchi with the tomato sauce then tip into an oven proof dish. Top with sliced mozzarella and pop under the grill to melt the cheese, serve with crisp salad.